When coal is heated strongly in absence of air, it forms a strong, porous, dense and coherent mass known as coke. 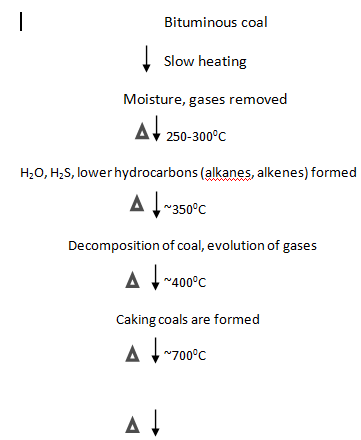 This process of conversion of coal into coke is called carbonzation. There are two types of carbonization. When the carbonization is carried out at 500-7000C, that it is called low temperature carbonzation. The coke contains 5-15% volatile matter and cannot be used for metallurgical processes. It ignites easily and is used in domestic usages. Coke obtained is smokeless and the byproduct gas obtained has high calorific value (6500-9500kcal/m3). When carbonization is carried out at 900-12000C, it is called high temperature carbonization. The coke produced has high strength, purity, hardness, desired porosity, and is used for metallurgical purposes. Coke obtained has low volatile matter (1 - 3 %) and the byproduct gas obtained has low calorific value (5400-6000 (kcal/m3).